The Boy is a 2016 American psychological horror film directed by William Brent Bell and written by Stacey Menear. The film stars Lauren Cohan and Rupert Evans. With a budget of just $10 million, the debuted on January 22, 2016. It has since earned more than $30 million despite the mixed reviews given by critics. The story goes like this: Greta is a young American woman who takes a job as a nanny in a remote English village, only to discover that the family's 8-year-old is a life-sized doll that the parents care for just like a real boy, as a way to cope with the death of their actual son 20 years prior. After violating a list of strict rules, a series of disturbing and inexplicable events bring Greta's worst nightmare to life, leading her to believe that the doll is actually alive. 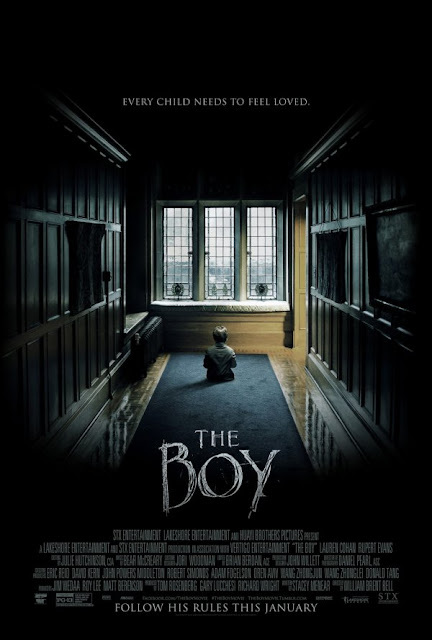 The Boy is of horror and thriller genre, which runs for approximately 97 minutes. It's rated PG-13 in most countries for violence, terror and some thematic material. This is my first horror movie for 2016 and it did not disappoint. There were a lot of nerve-racking scenes that would send shivers down your spine. While there have a been a lot of horror films that revolved around possessed dolls, the story of The Boy is quite different. It's something unique and fresh. The acting and story line are great. Sure, it's a low budget film but if you're looking for something that will raise hairs on the back of your head, then you should definitely consider watching this.